What Are Your Dental Resolutions for 2019? It’s the time of year where we all make resolutions to be better people and live better, healthier, more productive lives in the year to come. While diet and exercise often get the most attention when it comes to improving our health, our mouths play a huge role in our overall health and too often they get overlooked. 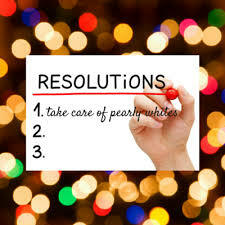 So we thought we would take this time to ask you: what are your dental goals for the coming year? If you haven’t had a chance to think about it, we have some ideas for you. Hopefully you’re already doing this, but one survey found that as many as 30% of Americans skip this vital step to developing and maintaining good health. Many diseases start in the mouth, where it’s wet and warm and full of nooks and crannies for bacteria to hide in. By simply making the time to brush and floss twice a day, every day, you can help make sure you stay healthy and avoid the diseases going around this time of year. Flossing is just as important as brushing, and like brushing, should be done once a day on a daily basis. But too many Americans skip this important step in taking care of their oral health, even if they make the time to brush their teeth twice a day. While your toothbrush and toothpaste can do a lot to clean your mouth, they can’t get in those hard-to-reach areas between your teeth where plaque can build up and compromise your teeth. That’s why you have to make the time to floss once a day. Ideally, you should be seeing your dentist every six months, but with everything we have going on in our lives, our oral health can sometimes take a back seat and it can be tempting to schedule things over our very important appointment with our dentist. This year resolve to make your oral health a priority by scheduling an appointment with your dentist right away if you don’t already have one scheduled. Put it on all your calendars and make sure everyone who needs to know (your boss, your spouse, etc.) knows that you have a dentist appointment and so you will be unavailable for anything else at that time. Sugar is one of the biggest threats to your oral health: it destroys your teeth and creates an environment in which plaque and bacteria thrive, so we suggest you get used to drinking unsweetened coffee and/or tea. Cut back on soda and sugar-filled snacks. If you chew gum, make the switch to a sugar-free option. If you use tobacco of any kind, resolve to quit in 2019. Whether you smoke or chew tobacco, it can stain your teeth and dry out your mouth, creating an environment where plaque and bacteria thrive. Chewing tobacco has also been linked to mouth cancer, so not only will your smile look better if you quit, you’ll also feel better knowing you’ve reduced your risk of getting a life-threatening illness. We cannot stress enough the importance of taking care of your teeth, and at Simply Smiles Dentistry, we’re here to help our patients do just that.